MIAMI - University of Miami student Katarina Zarutskie was relaxing in the Bahamas' turquoise waters at Staniel Cay when seemingly-docile sharks surrounded her. Her boyfriend, Tom Bates, was taking pictures. They didn't consider the nurse sharks a threat until one of them bit her and pulled her underwater. "Next thing I knew, I was underwater and adrenaline just kicks in," she said. The 19-year-old model grew up surfing in Southern California, so she remained calm. As soon as Zarutskie freed herself from the 5-foot shark, she raised her bleeding arm and walked over the other sharks and out of the water. She said doctors told her that she still has pieces of shark teeth in her arm. Despite a scar that could get in the way of her modeling, the nursing student said she feels lucky. 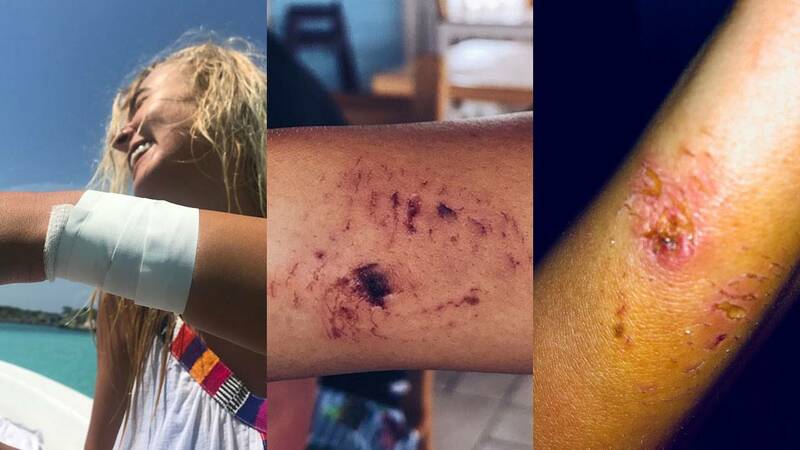 She was surrounded by sharks, but only one attacked. Zarutskie said she later learned that the risk of infection meant she could have lost her arm or her life. "You really need to respect them in their home, and if you do go swim with them, I think if you have the opportunity, you do have to take into consideration the risks, and also just maybe not lean back," Zarutskie said with a laugh.